Cannoli (the singular is cannolo) are typical Sicilian pastries. They consist in crunchy deep fried shells filled with a creamy ricotta-based mixture, usually containing candied fruit and chocolate chips. To make cannoli you need a few cannoli moulds; 3 is enough, but it’s easier and faster if you have at least 6. I use some cannoli moulds I ordered on amazon.co.uk. This recipe includes gelatine because the ricotta that I can find here seems to be a bit watery even after draining it, but it’s not a traditional ingredient. And remember, “leave the gun; take the cannoli”. You will need a few cannoli moulds. Makes 10 to 12 cannoli. Make the dough for the shells. Mix all the ingredients for the shell, except for the egg white and the oil, in a bowl until you get a uniform and smooth dough. Make a ball with the dough, wrap in some cling film and put in the fridge for at least one hour. Make the filling. Put the gelatine in a small bowl and cover with cold water for at least 5 minutes. Put the ricotta in a sieve to get rid of as much water as possible. With a spoon or spatula push the ricotta through the sieve into a bowl (collecting also the ricotta that remains on the bottom of the sieve). Mix the ricotta with the sugar and the orange blossom water until smooth. Add the chocolate chips and candied orange peels. Bring the milk to a boil in your smallest pan. When it starts boiling, turn off the heat and add the drained gelatine. Mix until completely melted. Slowly pour the gelatine into the ricotta mixture and mix very well. Put in the fridge for at least one hour. Cook the shells. Roll the dough until thin (1 or 2mm). Using a 4 inches (10 centimetres) wide cookie cutter or large glass, cut the dough in circles. You should get between 10 and 12. If you don’t have any cookie cutter of the appropriate size, you can cut the dough in rectangles. Press the circles a bit to enlarge them slightly and wrap around the cannoli moulds. The two opposite sides should slightly overlap. Seal the overlapping sides with the egg white. Heat enough oil to cover the cannoli in a pan big enough to fit 2 or 3 cannoli. Deep fry 2 or 3 cannoli at a time until browned on all sides. Remove from the oil and dry on kitchen towels. To remove the mould, let the cannoli cool down for a few minutes, then press the sides of the mould and remove. Let all the shells cool down completely. Fill and decorate the cannoli. Fill the cannoli pushing some ricotta mixture inside the shells from both sides with a teaspoon. Dust the cannoli with some icing sugar. 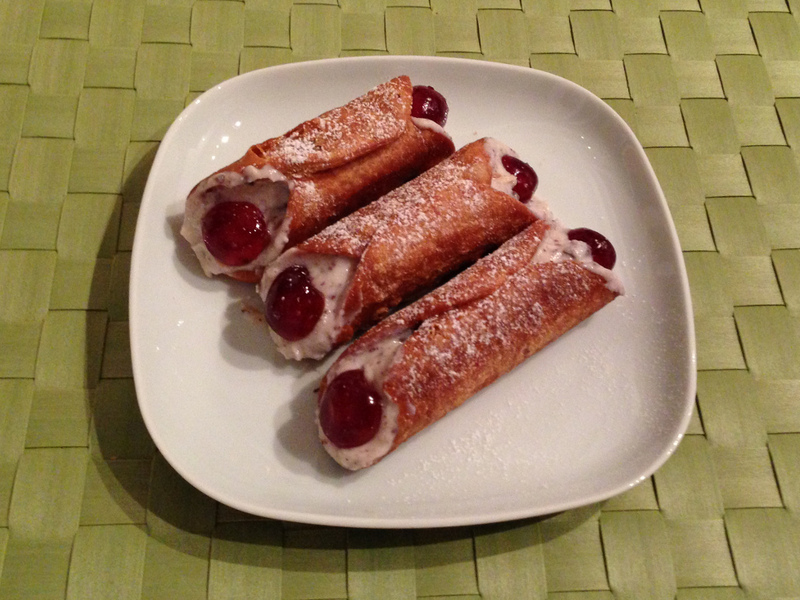 Cut the cherries in half and decorate the sides of the cannoli with them. This entry was posted in desserts and tagged candied fruit, candied peels, cannoli, cannolo, cherries, chocolate, deep fried, ricotta, sicilia, sicily by Marco Barisione. Bookmark the permalink.